The Fengdu Ghost City is located on the North end of the Yangthze River on Ming Mountain. If you wander through this old Chinese City, you will cross a landscape of ghostly loss that is rarely seen in this world. You can walk across The Bridge of Helplessness. This is the bridge every soul must cross before it can enter the underworld. 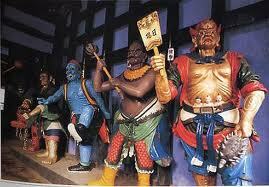 You will find statues of the ghost king, the judge of hell, the drunkard ghost, and the the lustful ghost. Every bend and turn of the road brings you to meet another building that would be found only in the land of the dead. Every statue is a depitction of a ghost. The Fengdu Ghost City is trully a ghost town..
Fengdu Ghost City got its name during the Han Dynasty when two officers came to Ming Mountain to practice toaist teachings. On Ming Mountain, these officers sought immortality and accourding to legend, they eventually became the kings of hell. During the Tang Dynasty a temple was built in this location to show life in hell. The temple was meant to be horrifying. It showed graphic depictions of the horrors that awaited those who did evil in hell. Now, Fengdu is an entire city dedicated to Diyu, the underworld of Chinese mythology. It isn't surprising that ghost stories linger in Fengdu. 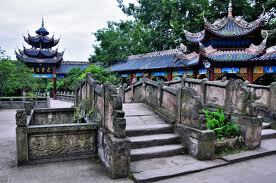 It is said that Fengdu was a Taoist cemetery before it became the ghost city it is today. Although the city bustles with tourists during the day, some believe it is crowded with ghosts after the night falls. Fengdu is one of the creepiest places in the world on almost every list of creepy places I have seen. It is certainly on my bucket list as one of the places I dream of going before I die. Labels: Fengdu Ghost City Ghost Cities Haunted Cities Haunted Places Haunted Places in China.